When I booked my trip to Oaxaca a few months ago, I started doing research to find out what new, exciting or undiscovered may have crept into the scene since I’d been there 2 years ago. Much to my chagrin, I found that it was just as difficult to source out new information on the Oaxaca dining scene as it was in the past. The one restaurant I did see mentioned a few times that piqued my interest was Pitiona. I originally discovered it through a Rick Bayless tweet, which led me to find it was listed on Conde Naste’s “Hot New Restaurants of 2011” list. Intrigued, I did some more research to find that chef Jose Manuel Baños did a stint at Ferran Adrià’s El Bulli. With my fascination of everything Adrià, that was enough to convince me that I needed to have a meal there. 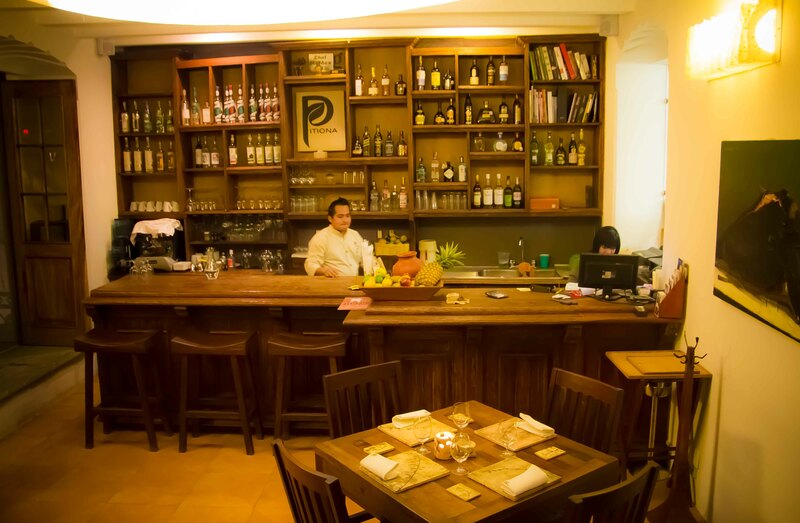 Pitiona was saved for my last meal in Oaxaca, but after my amazing experiences at Casa Oaxaca and Origen, I started to worry that the bar had been set very high. On my last day in Oaxaca, I wavered back and forth a few times on my choice to go to Pitiona or end my stay with something more traditional. I was at the end of an amazing food week in Oaxaca and although I felt like I was continuously eating, there were so many Oaxacan favourites that I didn’t have the chance to eat on this trip. In the end I knew that if I didn’t eat at Pitiona, I would regret it. Located up the road from the Santa Domingo, it’s moments of last sunlight like these that make me long to return. Walking into Pitiona, I marvelled at the old colonial house that’s become this beautiful restaurant which is comprised of many smaller rooms. We were seated in the front room where I took some time to pay attention to the wonderful art surrounding us. I haven’t mentioned it in any of my previous Oaxaca posts, but the one thing that truly shocked me on this trip to Oaxaca was how good Mexican wines are becoming. And I’m not saying “good for Mexico”, I’m saying “good”. At Origen we had a Santo Tomas Barbera that was scrumptious. At Pitiona, Tom was very excited to see a Mexican Nebbiolo from La Ceta that was also very good. I quickly wandered around the rooms and the bar looked like a great place to sit for a nice drink. 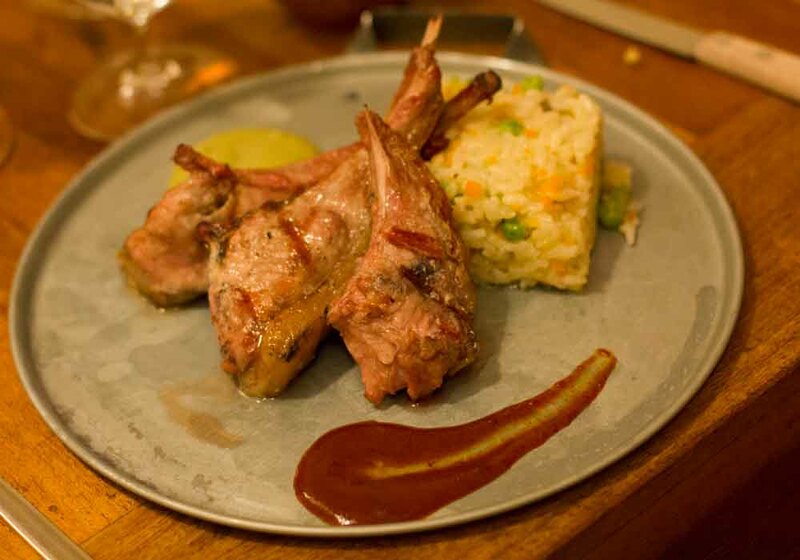 We were sent to Pitiona with a “to eat” list from Chef Rodolfo Castellanos of Origen. His list consisted of what I translated as “noodle soup, wild boar, torta Milanese and ant mole”. It was an intriguing list, and while those may not have been our first choices, we’re never one to cast aside recommendations from trustworthy sources. 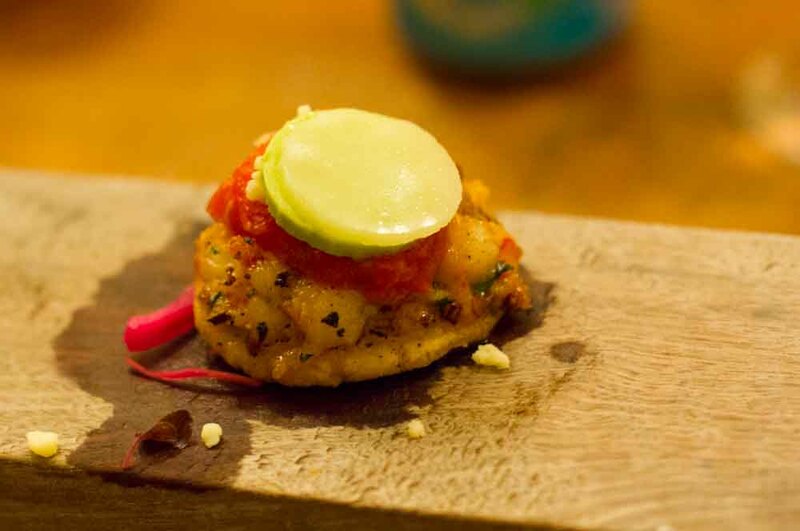 Seafood garnacha amuse bouche- small corn tortilla topped with shrimp, pickled onions and an avocado round. 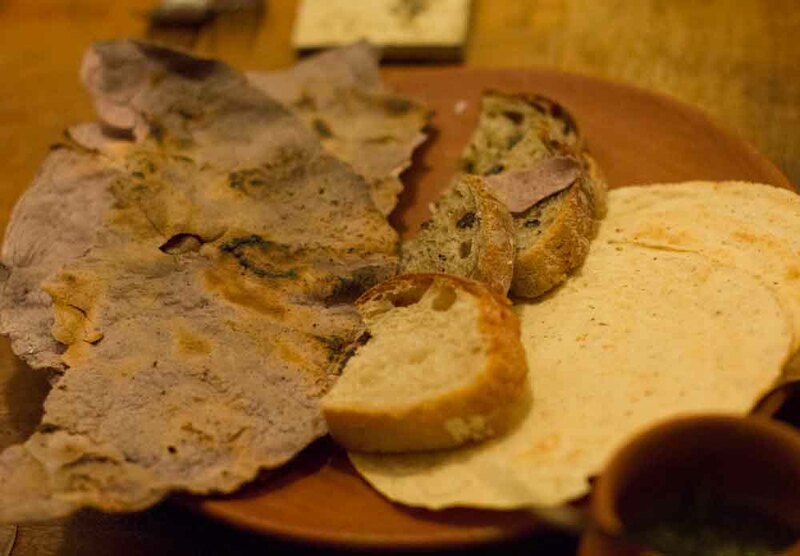 Selection of breads and tortilla for the table. The bread was devoured quickly, by most at the table. I couldn’t stop eating the blue corn tortilla with the assortment of salsa. 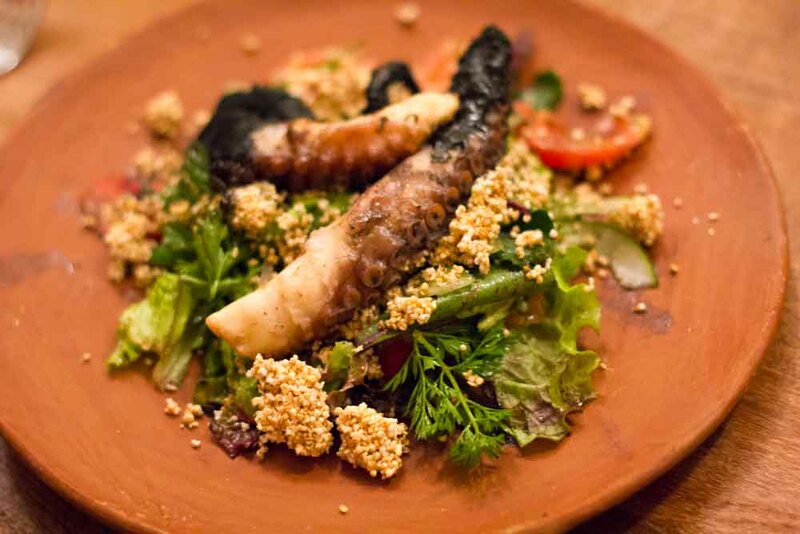 Ensalada Ahumada de Pulpo (Smoked octopus salad) – wonderfully seasoned with great contrasting textures. 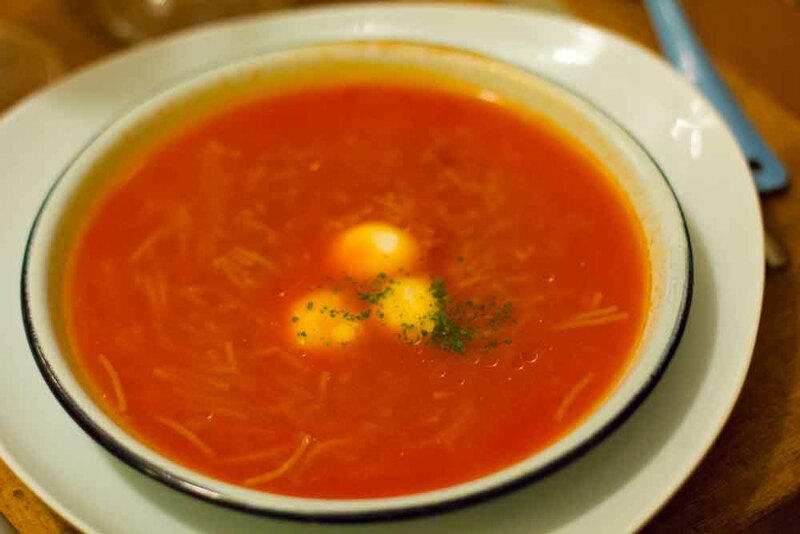 Sopa de Fideos (Noodle soup) – Seeing those Adria “spheres” of cheese floating in a soup served to me in Oaxaca, tells me how connected the world-wide gastronomic community really is. 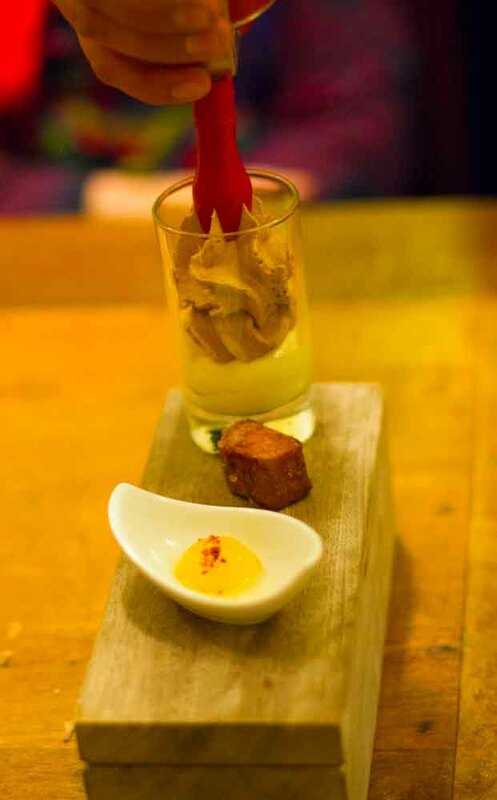 Rompe Catres – Having no idea what this was, and seeking no explanation, Jo ordered this. This wholesome soup was my favourite of all the starters. 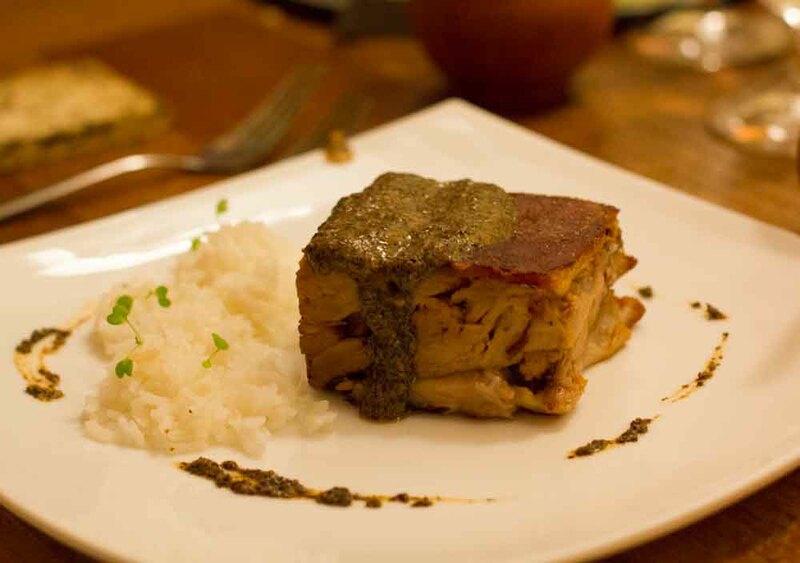 Lechon(suckling pig) con Mole de Chicatana – I found it curious that the word chicatana is not translated as “flying ants” on their english menu. The pork preparation was amazing. I found the mole to be challenging, but in a good way as it was a brand new food experience for me. 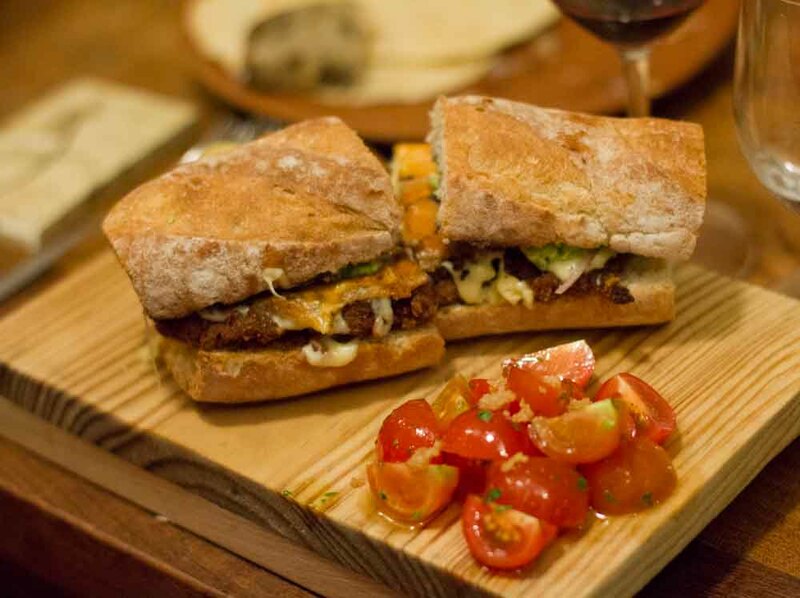 Torta de Milenesa de Venado (venison) – never did we think sandwich when we saw torta. But sometimes the biggest surprises are when things turn out to be exactly as they seem. I took the leftovers of this and had it the next day while sitting in MEX. Best airport snack ever! 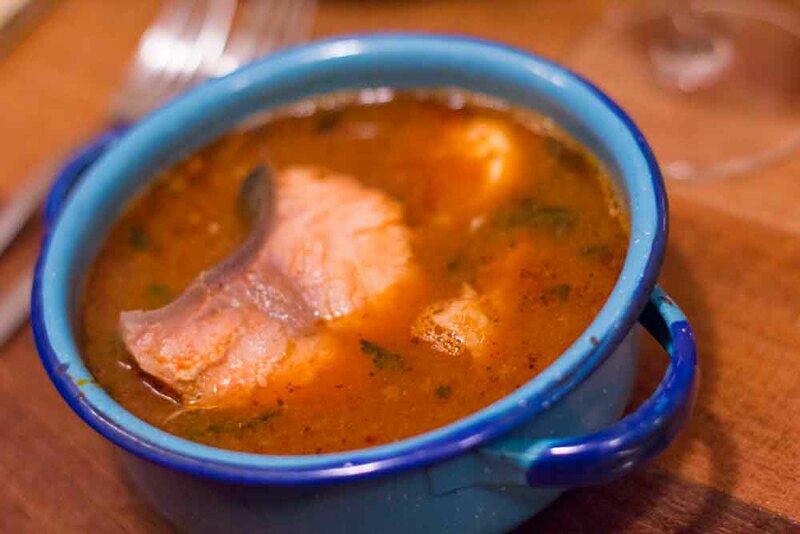 Pescado Tierra y Cacao (Fish Ground and Cocoa) – This was described as sauce from the earth with cocoa and coffee. 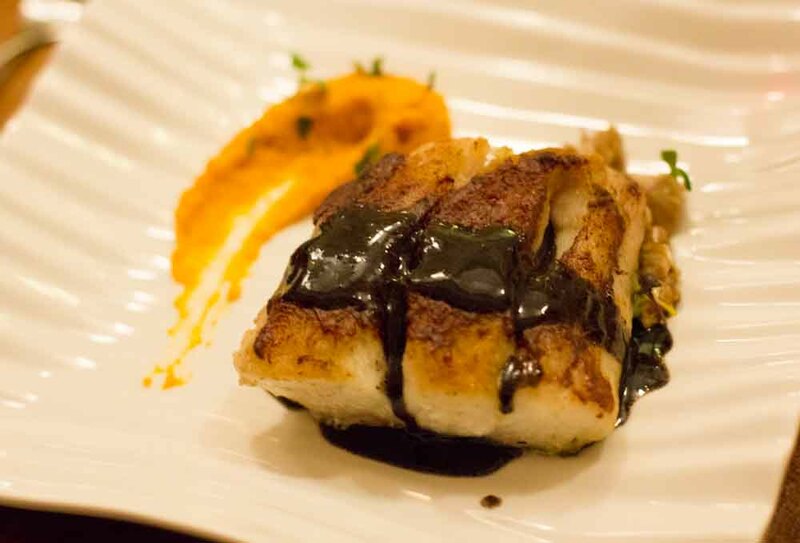 The fish was cooked perfectly and the sauce was very earthy, with a flavour I couldn’t quite put my finger on. Jabali (wild boar) con Coloradito – I didn’t have a chance to taste this because I became a bit distracted. 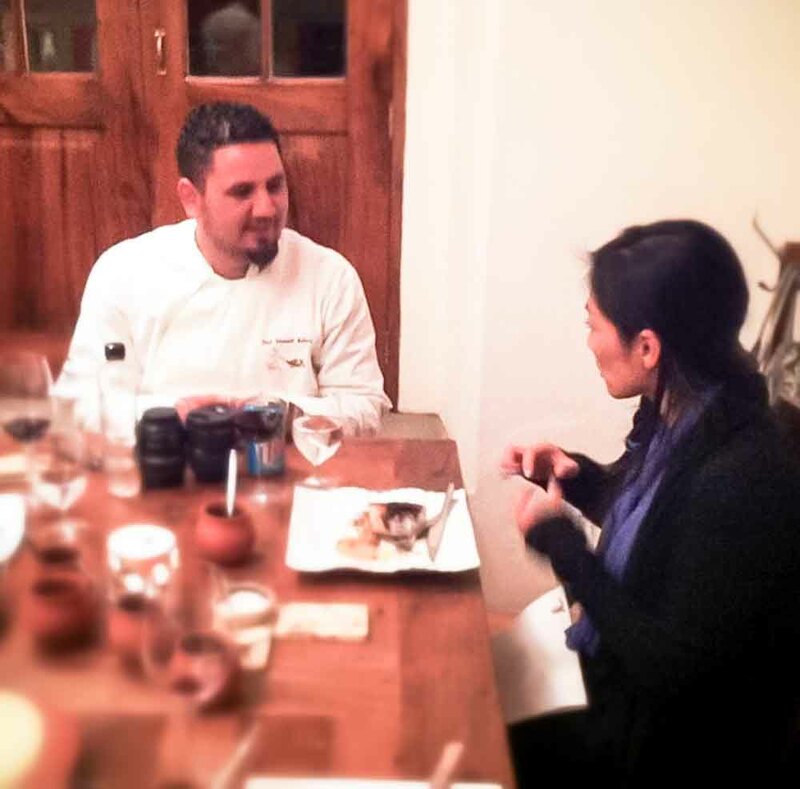 Shortly after our entrees were served, Chef Jose Manuel Baños sat down at our table with us to chat. I have to admit that I became so engrossed in our conversation that I stopped eating. 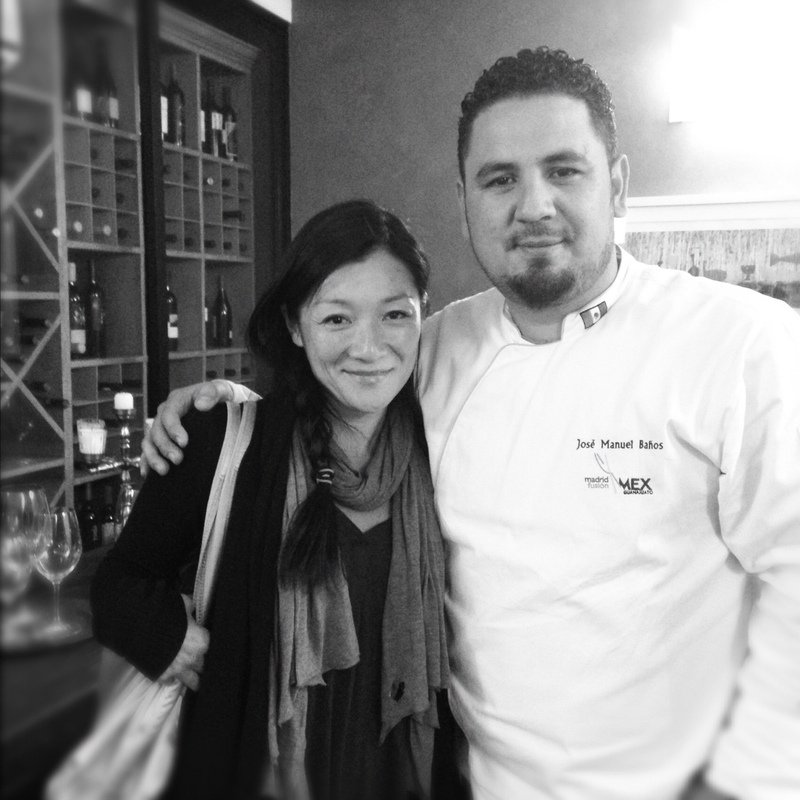 Because I was fascinated that Chef had spent time in Adria’s kitchen, I had to start there. Chef Baños mentioned that he came to El Bulli via Arzak in San Sebastian and when he spoke of his time at Arzak, he really lit up. He used the adjective “great” to describe Juan Mari Arzak and you could sense the feeling of respect that he has for this mentor. I felt grateful to have this conversation with the chef and to be able to ask about the techniques, ingredients and thoughts put into the making of a dish. When I dug a bit deeper into the Tierra Y Cacao sauce, I realized that the very familiar taste that I couldn’t put my finger on was “washed dirt”. We talked about the food he was serving, because from my comparison of the Pitiona, Origen and Casa Oaxaca, it felt like his was pushing the boundaries of Oaxacan cuisine the most. Chef Baños was clearly using indigenous Oaxacan ingredients but presenting plates that were very modern and serving a combination of very home-style food (the torta and soups) combined with contemporary techniques (spherification) and unique ingredients. It seems though that as highly technical as his cooking has become, he will always have strong roots in tradition. 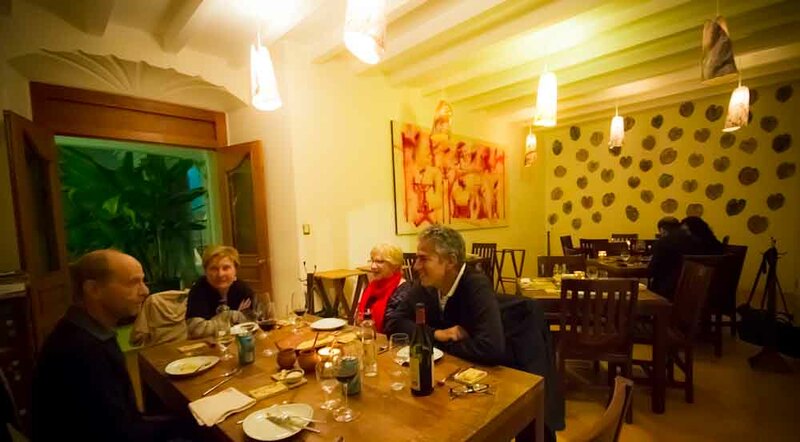 We finished our conversation with a brief discussion on dining in Oaxaca. On this trip to Oaxaca, I sensed a movement in the culinary scene where some very exciting results are being seen. Again and again, I couldn’t believe that more food lovers don’t journey here for the experience. I’ve always believed that if you like food then you should visit Oaxaca, but now I’m convinced that Oaxaca is a great destination for a gastronomic vacation. Chef agreed that Oaxaca is on the cusp of “being found”, although he believes it’ll happen sooner than I. I’m torn though, because on one hand, I’d love to see these chefs get the attention they deserve, but on the other hand, once that happens, experiences like these for me will be harder to come by. Oh well, I’ll just have to keep returning to Oaxaca frequently enough to keep building on great memories while I can! 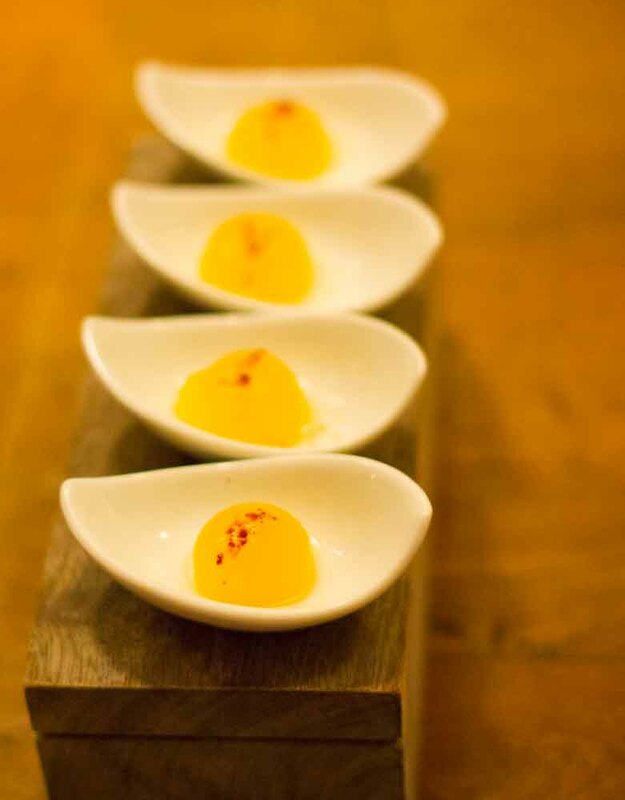 They were nice enough to serve extra mango spheres for us all to try. There’s something about sphered food that puts a smile on my face. Great way to end the meal. Many thanks to the chef for my memorable last meal in Oaxaca! I think there is something magical about ordering off a menu when you have no idea quite what to expect. To be impressed by the surprise is good too. 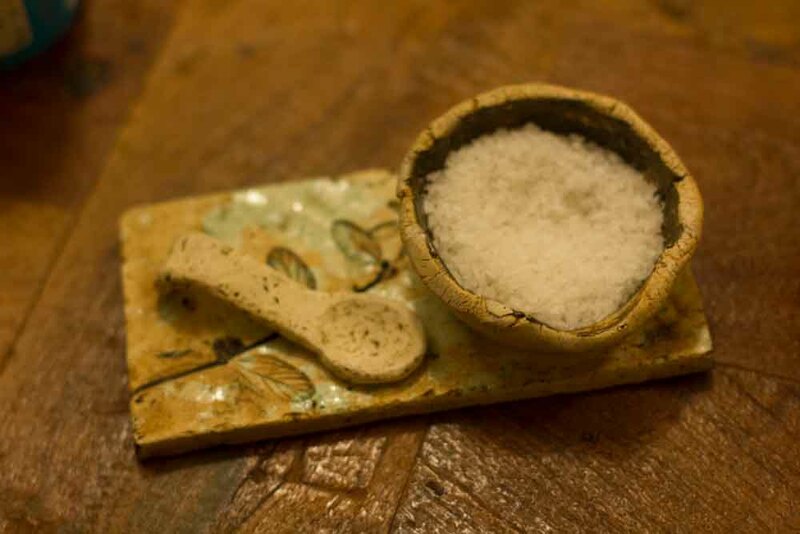 Magical is a fantastic way to describe my meals in Oaxaca. And as most meals were lost in translation, I was constantly being surprised.